The 1982 NS500 and 1984 NSR500 Grand Prix Racers. When Honda made the decision to return to the premier class of Grand Prix motorcycle racing in 1975, it did so with a great deal of optimism. The Japanese company had withdrawn in 1967 for numerous reasons (see the Honda NR500 story) yet when it officially announced its return in 1977 the 500cc Grand Prix landscape had shifted dramatically. The two-stroke racing engine reigned supreme; even the four-stroke Grand Prix racers of the mighty MV Agusta team had withdrawn in 1976 leaving a two-stroke monopoly on the class. Honda’s Japanese rivals, Yamaha and Suzuki, had by now both won 500cc world titles, Yamaha winning Japan’s first 500cc World Championship with the great Giacomo Agostini in 1975 and Suzuki winning titles in 1976 and 1977 with the talented Barry Sheene. This must have been a severe “loss of face” for Honda who pioneered Japan’s first foray into Grand Prix racing. And the decision by Honda to build a four-stroke racing engine within the limitations of the regulations was a bold one. Honda’s approach reflected the philosophy of the companies’ founder, Soichiro Honda, a stalwart of the four-stroke design. However, the plan documents for Honda’s “New Racing” engineers stipulated three years to win the world championship. By 1982 it was clear that the four-stroke racer was unlikely to get on even terms with the two-strokes. In a racing sense the oval piston eight-valve NR500 V4 was indeed a failure, but as a technical exercise, it was an outstanding achievement. But regardless of Honda’s aversion to the two-stroke engine, it did have experience with the concept going back to 1974 with the release of the highly successful Honda Elsinore CR125 and CR250 motocross racers. Veteran engineer Shinichi Miyakoshi, who had designed four-stroke GP machines for Honda that dominated Grand Prix racing in the 1960’s, was assigned to the task of developing Honda’s first two-stroke GP racer. The experienced Miyakoshi had been designing two-stroke engines for the motocross group within Honda, which proved to be invaluable to the gestation of the new two-stroke NS500 Grand Prix racer. Spencer in action on the NS500 V3. In June 1981 Miyakoshi visited the Dutch TT at Assen in Holland. There he noted that the fastest of the 350cc GP machines would have qualified on the second row of the grid for the 500cc race. Hence the concept for the NS500 became one of a compact and light machine with a small frontal area of a 350cc GP racer. The engine would be designed for usable power and optimum control, not top speed. A compact V3 layout was chosen using reed valves for smoother power delivery and easier starting (push starts were mandatory at that time). The idea was to have a machine with total balance, and again Honda would utilise its motocross experience for the suspension of the NS500. Interestingly the V3 engine configuration had been used before. German manufacturer DKW had employed it in the 1950’s for its 350cc GP racer. The NS500 also used similar engine architecture to the DKW with two upright cylinders, but unlike the DKW the third cylinder pointed downwards at 112 degrees instead of the more conventional 90 degrees of the DKW. 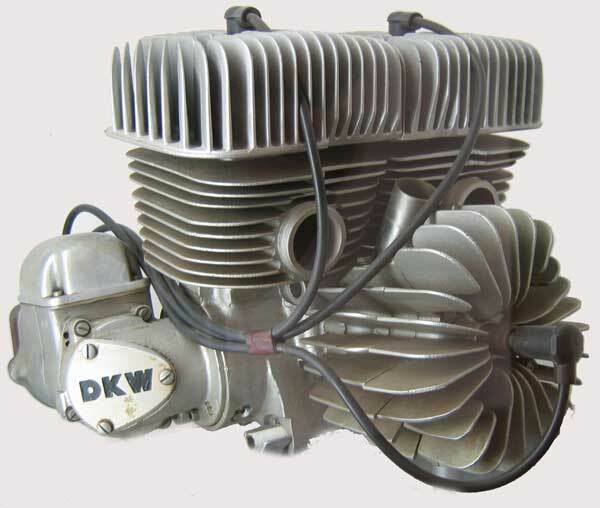 DKW’s air-cooled 350cc V3 two-stroke engine. Another significant part of the NS500’s rationale would be its ability to maximise its tyre wear. Racing slicks at this time were still using bias belt construction, and the harsher power characteristics of, the more powerful rotary valve engines from Yamaha and Suzuki punished the tyres, particularly towards the end of a Grand Prix. The more agile Honda would be able to maintain higher corners speeds for longer, which would negate to a certain degree its lower top speed down the straights. The NS500 debuted in 1982 in the hands of reigning 1981 World Champion, Italian Marco Lucchinelli, whom Honda had lured away from Suzuki. Korean born Japanese Takazumi Katayama was again part of Honda’s 500cc rider line-up alongside the promising 20-year-old American Freddie Spencer who was promoted full-time to the Grand Prix squad. It was not until the seventh race of the season in Belgium at the Spa Francorchamps circuit that Honda tasted victory. The win was Honda’s first in15 years and remarkably it was at a circuit renowned for its high speed. And it was “Fast” Freddie Spencer that had ridden the NS500 to victory, his main opposition suffering tyre and mechanical problems. By the end of the season, Spencer had won two races (Belgium and San Marino) and achieved three podiums. Katayama also won the Swedish Grand Prix, but this was just a taste of what was to come. Spencer chases Takazumi both on the NS500. 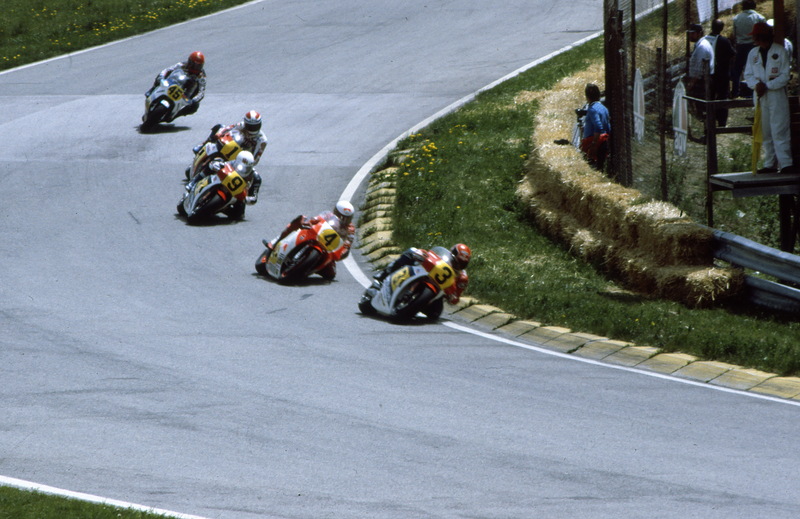 The 1983 season saw an epic battle between “King” Kenny Roberts and “Fast” Freddie Spencer. At the penultimate round in Sweden Spencer had claimed a forceful victory with Roberts running off the track before finishing in second place. In the twelve round race series, it was Spencer that had accumulated six race wins to Robert’s five. If Roberts won at the last round in San Marino Spencer would have to finish second to claim the championship. 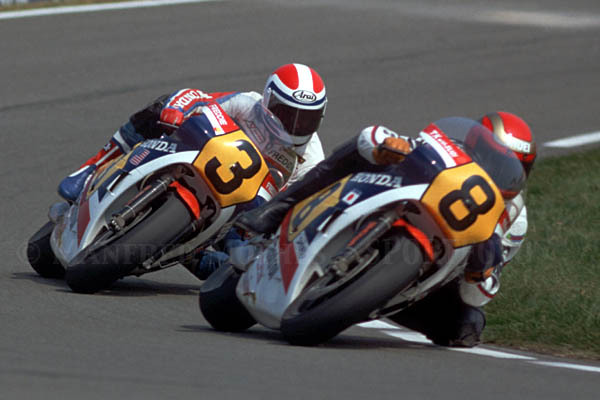 Indeed Roberts won in Italy, but despite slowing tactics by “King” Kenny in an attempt to put his teammate Eddie Lawson between them, Spencer was still able to finish in second place claiming Honda’s first 500cc World Championship by two points. Although the lateral thinking behind the V3 triple had borne the fruit of victory, it was clear to Honda that with the introduction of radial racing slicks and the limitations of the Honda’s V3 engine architecture that a V4 would be needed against the more powerful opposition from Yamaha and Suzuki for the 1984 season. Honda decided to enter the power war, but again in typical Honda fashion. In contrast to the twin crankshaft OW76 Yamaha V4 and the twin crankshaft Suzuki RG500 XR45 square four, the 1984 Honda NSR500’s 90-degree V4 used a single crankshaft as this design reduces frictional losses to maximise horsepower. But if anything it was the chassis of the ’84 NSR500 that pushed the envelope. Honda had been supplying its four-stroke RSC1000 endurance-racing engine to the avant-garde ELFe endurance racer. With the financial backing of the French oil company ELF and Honda itself, Andre de Cortanze and his team had devised a radical alternative to the conventional motorcycle chassis. Using a single-sided swingarm at the rear for quick wheel changes, the front also boasted twin swingarms utilising a steering system that could loosely be described as hub centre steering that again allowed the front wheel to be removed from one side. The objectives of the ELFe were “reduced weight, lower centre of gravity, improved anti-dive under braking and elimination of a conventional chassis”. 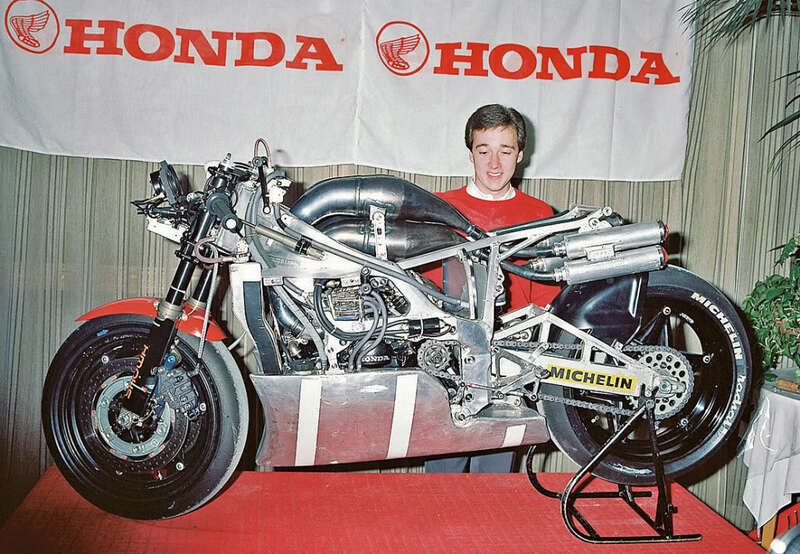 Freddie Spencer and the innovative V4 NSR500 Honda. The lower centre of gravity of the ELFe was achieved by mounting the fuel tank under the engine with the exhaust exiting over the top of the engine. It should also be noted that English endurance race team Mead and Tompkinson preceded the ELFe with their creation nicknamed “Nessie” in the mid-1970’s which used Difazio hub centre steering and the same under engine fuel tank and above engine exhaust layout. But it was the ELFe that the Honda engineers took inspiration from. Although retaining a conventional suspension layout, the lower centre of gravity of the ELFe underslung fuel tank was deemed a desirable asset. The NSR500 first appeared at the 1984 Daytona 200 in Florida, and the initial result was promising with Freddie Spencer setting a lap record of 116.87mph (188.08kph) in qualifying to take pole position. During the race though, tyre problems and a slipping clutch relegated Spencer to second place behind Kenny Roberts. But two weeks later at the opening round of the 500cc World Championship at the Kyalami circuit in South Africa disaster struck. During practice, another innovation of the NSR500 V4, its carbon fibre composite rear wheel, collapsed causing Spencer to crash and sit out the race. The reigning World Champion bounced back, however, to win the Italian Grand Prix at Misano on the V4. This was then followed by another crash while leading the fifth leg of Trans-Atlantic Challenge races at Donnington. This forced Spencer to miss the Spanish Grand Prix at Jarama, returning to compete at the Austrian Grand Prix at the Salzburgring. It was apparent to the spectators watching the race that the NSR500 V4 had handling issues, especially under power exiting the esses onto the main straight. Indeed Randy Mamola on the factory Honda NS500 V3 allowed his team leader through to take second place behind championship leader Eddie Lawson infuriating the crowd who showed their dislike by booing Spencer and Mamola on the slow down lap. Spencer’s chief engineer Erv Kanemoto and mechanic George Vukmanovich walk the V4 NSR500 back from the pits in Austria. 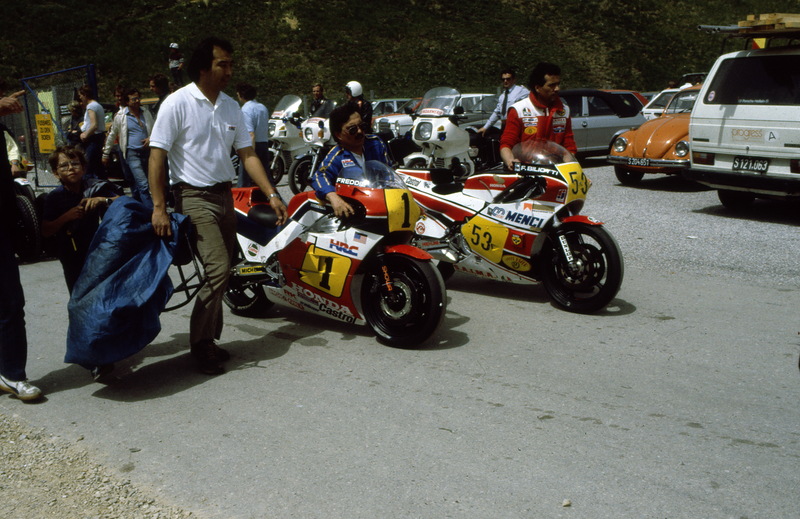 Freddie by now was getting desperate to bridge the points gap to Eddie Lawson and demanded the NS500 V3 for the next race at the Nurburgring. A mad dash was made to take Marco Lucchinelli’s NS500 out of mothballs in time for the race which Spencer duly won on the V3. This was a bitter pill for Honda to swallow and an embarrassment to a company where new is seen as better. The problem lay with the underslung fuel tank, which by lowering the centre of gravity also affected weight transfer under braking and acceleration which was not generating enough force onto the front and rear tyre, thereby reducing grip. Heat build up from the over the engine exhaust system was also a problem as it heated the air going into the carburettors. The positioning of the expansion chambers themselves also made it difficult to check and change spark plugs and to undertake fine-tuning of the carburation, all crucial to a two-stroke racing engine within the time limitations of the practice sessions. Spencer somehow went on to win the next two Grand Prix on the V4 at Paul Ricard in France and Rijeka in Yugoslavia. The next race was the Dutch TT at Assen. After practicing on the V4, Spencer decided to switch to the V3 for the race after practice had finished. This was scuppered by the supplementary regulations, and Freddie was forced to start on the V4. A broken spark plug cap put an end to Freddie’s race as the title began to slip further from his grasp. Again Spencer opted for the V3 for the Belgium GP at Spa and won the race. Then once more fate played a hand with Freddie crashing at an international meeting at Laguna Seca in California. The crash re-broke an old fracture Spencer had suffered two years before so the reigning World Champion would miss the three final races of the season at Silverstone in Britain, Anderstorp in Sweden and the San Marino GP at Mugello in Italy. 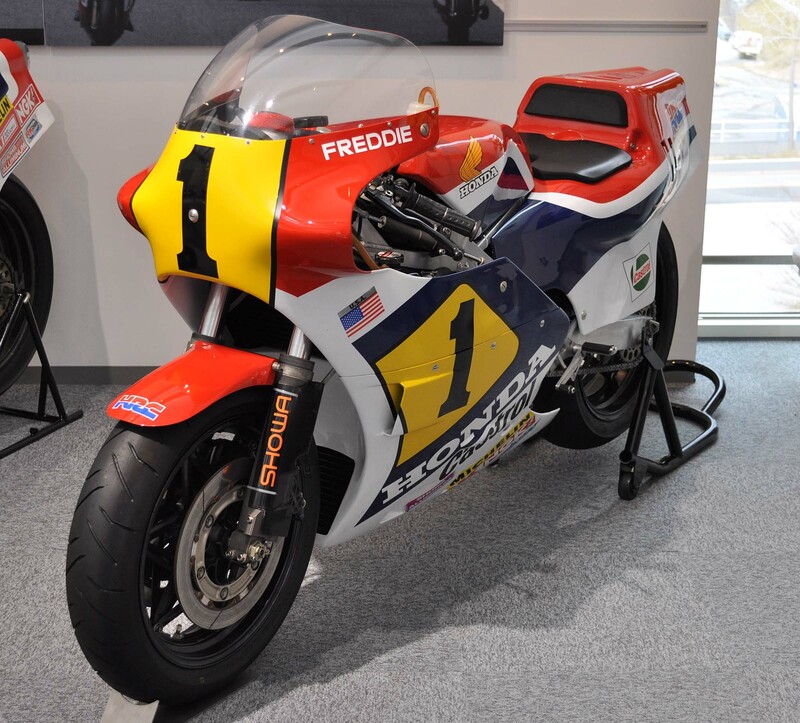 This effectively handed the riders World Championship to Honda’s arch-rival Yamaha and gave Eddie Lawson his first world title. Honda did have the consolation of winning the manufacturer’s trophy, but this was more due to the number of factory supported and privateer riders competing on the NS500 V3. Randy Mamola on the Honda NS500 V3 leads Eddie Lawson on the Yamaha OW76 V4 , Ron Haslam Honda NS500 V3 and Spencer on the Honda NSR500 V4 in Austria. It would be unfair to say the 1984 NSR500 was a disappointment; the V4 did win three GP’s and a podium second place. Considering Spencer only contested 6 of the 12 rounds (missing 2 races through mechanical problems and a further four races through injury) fourth place in the rider’s championship was quite a remarkable achievement for Freddie. Spencer also won 2 GP’s on the NS500 V3 while Randy Mammola won 3 GP’s and accumulated 5 podiums also on the V3 Honda. Which begs the question, would Spencer have defended his title had he campaigned the proven NS500 V3? Hindsight, of course, is a wonderful thing, and one has to admire Honda for empowering its engineers to look for new solutions with the 1984 NSR500. The single crankshaft V4 engine, however, more than lived up to Honda’s high expectations and the NSR500’s that followed, utilising a more conventional chassis, became the most successful 500cc machines in Grand Prix racing history. Words Geoff Dawes © 2016. Photographs © Geoff Dawes 1984 and courtesy of http://www.blogs.yahoo.co.jp, http://www.commons.wikimedia.org, http://www.s307.photobucket.com, http://www.southbayriders.com. Below is a short documentary about the NS & NSR 500 Grand Prix racers courtesy of Honda. 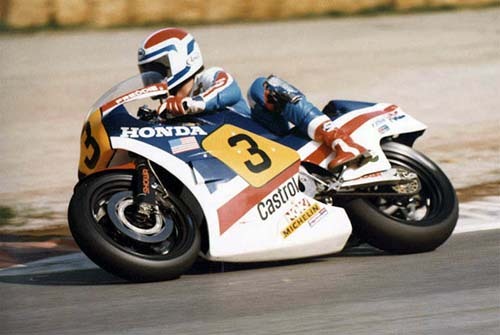 This entry was posted in Motorcycle Racing and tagged Eddie Lawson, Freddie Spencer, Honda 1984 NSR500, Honda NS500, Marco Lucchinnelli, Randy Mammola, Shinichi Miyakoshi, Takazumi Katayama on 23/02/2016 by Geoff Dawes.